Our well-equipped practice rooms feel modern and fresh and have benefited from considerable investment in new dental equipment. Did you read about us in The Falkirk Herald? Una was a nervous dental patient before she came to us. Listen to what she has to say now. Click to play. Our dentists promise to treat you in a caring, friendly and professional manner.When you visit our dental practice you can be assured you will receive first class care for your teeth. Do not suffer in silence if you are unhappy with your smile. Perhaps your teeth have been crooked since childhood, maybe they have been broken in an accident or one is missing or darker than the rest. Talk to us today about some of the cosmetic dentistry options available to you. Envisage is closely aligned with one of the foremost cosmetic dentistry practices in Glasgow. This partnership allows us to offer a wide variety of advanced cosmetic treatments. White fillings are a great cosmetic option and have become popular for replacing old-style unsightly dark fillings. Envisage Dental Health is closely connected to one of the best-reviewed practices for dental implants in Scotland. The ideal option for many patients with dark, misaligned, broken or badly chipped teeth. Shaded to match your natural smile. A greta solution for teeth which are broken, for teeth which have very large fillings or for example, teeth which have had root treatment. Discover a straighter smile with our short term orthodontics treatments. Fast safe and increasingly popular with our adult patients. We fit the latest types of cosmetic dentures here in Larbert including acrylic dentures and metal cobalt chrome dentures. I met Dr A McCarthy and I actually look forward to seeing him! That is a major change as I would see the word dentist and freak out. The staff are all so friendly and kind right from the receptionist to the Dental Assistants. If you are scared give it a go, is my advice, if I can get this far so can you. I cannot rate this dentist and his team highly enough. It is life changing. I have had previous dental traumas which left me pretty dental phobic. Despite this I attended for six monthly check ups religiously, but with great trepidation. I attended today for an extraction by Dr McCarthy and can honestly say that I did not feel a thing. Thank you so much. I will now attend my six monthly check ups with much less angst. Relax. Our staff are particularly good at putting patients at ease. They will answer all your questions and reassure you about any issues you might have and our dentists will take time to explain all of your treatment options. If you pay for your dental treatment we can help you spread the cost with easy payment and pay as you go plans. Ask our reception staff. Find out about our interest free and low cost dental plans! We provide you with a choice between NHS dental services and private dental treatments because. 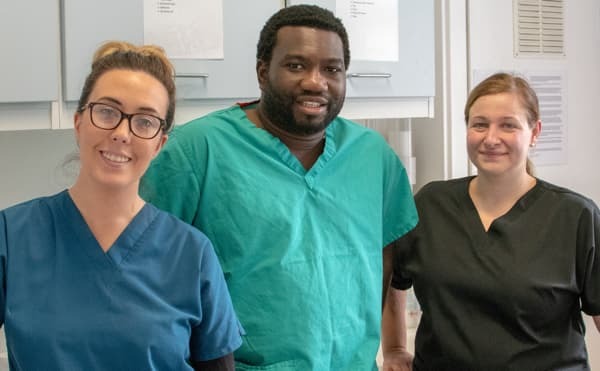 We are committed to ensuring patients in Larbert, Denny and Stenhousemuir receive the best dental healthcare possible. Abe and the full team at EnVisage made a normally very nervous patient feel relaxed and enjoy the dentist! Fantastic decision to get Six Month Smiles with an outstanding result! 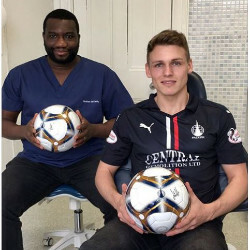 Falkirk FC midfielder Joe McKee is a big fan of our Larbert dental practice. As well as general dental treatment, Joe came to see us for Six Month Smiles braces. He had been concerned about his lower front teeth being crowded and was having difficulty flossing. Six Month Smiles is a fantastic form of short term orthodontics helping patients straighten their teeth in double quick time. Our dental practice provides free wifi in the waiting room for the convenience of our patients.